Australia has a number of hybrid fibre coaxial networks that pass about 3 million premises. These networks constitute an underutilized resource that could provide high quality, high speed broadband services to 7 million Australians at minimal cost. This has now been recognized in NBN Co.?s recent strategic review and the introduction of the multi-technology mix solution for the NBN. This paper describes how the hybrid fibre coaxial networks can provide all the required features of the NBN and the potential upgrade path to a future all-fibre access network. In Australia there are at least four hybrid fibre coaxial (HFC) network operators: Telstra, passing about 2.8m homes; Optus, passing about 2.2m homes in the bigger cities; TransAct (iiNet) with Mildura, Ballarat and Geelong networks passing about 90,000 homes; and Service Elements and OptiComm in Perth, W.A.. Combined, these networks pass about 3m homes today and could serve about 7 million Australians. They provide cable television and internet (cable modem) service with downlink speeds up to 100 Mb/s. In contrast to overseas markets, such as those in North America, Japan and Korea, where cable broadband networks are often used to drive sustainable, competitive broadband infrastructure, in Australia the HFC networks are largely operated by traditional telecommunications providers. Because of a lack of infrastructure competition in Australia, most attention has been paid to high-speed broadband over copper networks and the HFC has been an underutilized resource. This has now changed with NBN Co.?s strategic review (NBN 2013), which has recognized HFC as part of a multi-technology mix for the development of the National Broadband Network (NBN). C-COR Broadband has been advocating the use of the HFC in submissions to the Australian Senate since 2009 (Cox 2009a, 2009b; C-COR Broadband 2010). In this paper, we are concerned to dispel the myths that the Australian HFC networks are not capable of providing consistent, high quality broadband services and that there is no feasible upgrade path to ever higher network performance. We describe instead how all the features required by the NBN fixed network concept ? including high downlink (and, importantly, uplink) speeds, wholesale and layer 2 services ? can be delivered over HFC using the DOCSIS standard. In addition, we describe the upgrade path for HFC to an all-fibre access network through a maturing standard called Radio Frequency over Glass (RFoG). The cable TV industry was born in 1946-1948 as part of the broadcast industry, to fulfil a need for improved reception of TV signals in smaller population centres in the USA. By sharing a single well-positioned antenna and distributing the TV signals via coaxial cable, communities were able to upgrade their TV signal reception. This became known as Community Access TV (CATV). By 1975, CATV system technology had matured. Head End (HE) systems, which enhanced the original and simple common antenna, resembled the form, functions, and performance of pre-1995 HFC systems. The CATV hybrid amplifier, now the cornerstone component in modular distribution optical nodes and amplifiers, was well established and two-way CATV technology was well understood. Cable networks have been deployed universally with an active reverse path (from the customer premises to the head end) since the inception of HFC in the 1980?s and, with the introduction of the first HFC optical node in 1986, and the rollout of HFC networks beginning in the early 1990s, CATV hybrid amplifier performance requirements have steadily increased. The adoption of the DOCSIS standard and its subsequent revisions has acted as a catalyst for growth of HFC networks. The Data Over Cable Interface Specification (DOCSIS? (CableLabs 1997)) is an international telecommunications standard that permits the transmission of internet protocol communications over an existing CATV system. There are two distinct versions, DOCSIS and EuroDOCSIS. DOCSIS was developed by CableLabs and contributing companies (including 3Com, ARRIS, BigBand Networks, Broadcom, Cisco, Conexant, Correlant, Harmonic, Intel, Motorola, Netgear, Technicolor, Terayon, and Texas Instruments). A DOCSIS architecture includes two primary components: a cable modem located at the customer premises, and a cable modem termination system (CMTS) typically located at the CATV head end (although some distributed systems are appearing). Cable systems supporting on-demand programming use a hybrid fibre-coaxial system. Fiber optic lines bring digital signals to nodes in the system where they are converted into RF channels and modem signals on coaxial cable trunk lines. A typical CMTS is a device which hosts downstream and upstream ports (in functionality similar to the DSLAM used in DSL systems). While downstream and upstream communications travel on a shared coax line in the customer premises, and connect to a single F connector on the cable modem, it is typical for the CMTS to have separate F connectors for downstream and for upstream communication. As frequency allocation bandwidth plans differ between the United States and European CATV systems, DOCSIS standards have been modified for use in Europe. These modifications were published under the name EuroDOCSIS. The differences between the bandwidths exist because European cable TV conforms to PAL standards of 8 MHz bandwidth (as in Australia) and North American cable TV conforms to NTSC/ATSC standards, which specify 6 MHz bandwidth. DOCSIS 1.0: Released in March 1997, it included functional elements from preceding proprietary cable modem products (Cablelabs, 1997). DOCSIS 1.1: Released April 1999, the specification added full standardization and quality of service (QoS) capabilities (Cablelabs, 1999). DOCSIS 2.0: Released December 2001, DOCSIS was revised to enhance upstream transmission speeds. This was due to increased demand for symmetric services such as IP telephony (Cablelabs, 2001). DOCSIS 3.0: Released August 2006, the specification was revised to significantly increase transmission speeds (this time both upstream and downstream). Channel bonding was first introduced with this version of the standard along with support for Internet Protocol version 6 (IPv6) (Cablelabs, 2006). DOCSIS 3.1: Released October 2013, it plans to support capacities of at least 10 Gb/s downstream and 1 Gb/s upstream using 4096 Quadrature Aperture Modulation (QAM). The new specifications will do away with 6 MHz and 8 MHz wide channel spacing and instead use smaller (20 kHz to 50 kHz wide) orthogonal frequency division multiplexing (OFDM) subcarriers; these can be bonded inside a block spectrum that could end up being about 200 MHz wide (Cablelabs, 2013). Cross-version compatibility has been maintained across all versions of DOCSIS, with the devices falling back to the highest supported version in common between the cable modem and the CMTS. For example, if a cable modem only supports DOCSIS 1.0 and the system is running DOCSIS 2.0, the connection will be established at the lower DOCSIS 1.0 speeds (Cablelabs, 1997-2013). There has been significant bandwidth and channel capacity growth over more than six decades of service evolution ? video, voice, and data alike ? and this has given operators a sound historical basis for business planning of new growth scenarios. For example, in January 2012, the UK broadband provider Virgin Media announced plans to double the speeds of selected broadband packages: its 10 Mb/s package increased to 20 Mb/s; 20 Mb/s and 30 Mb/s to 60 Mb/s; 50 Mb/s to 100 Mb/s; and its 100 Mb/s package to 120 Mb/s. Australia started building its own HFC networks in the period 1994/1995 with competition between Optus and Telstra. Today the HFC networks pass approximately 3 million homes in key capital cities. The original networks are now fully depreciated. Each is ?future ready?, which means that it is designed to increase its capability and capacity in a low cost, staged fashion over time. 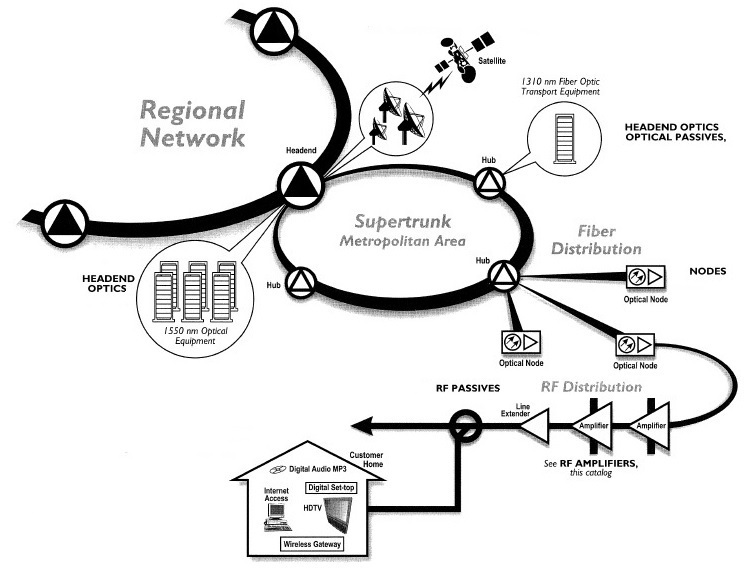 The classic HFC approach depicted in Figure 1 is somewhat representative of our Australian networks and has benefitted from the availability of new HFC capacity, incrementally exploited through fibre deep extensions, RF bandwidth upgrades in the distribution plant, use of WDM to fuel segmentation and service options, and migrating to either all digital services and or switched digital video architectures, or a mix thereof. The Australian cable broadband operators have made considerable investments in back office systems for DOCSIS voice and data services that would be leveraged for DOCSIS 3.0 technologies. As a result, DOCSIS 3.0/3.1, coupled with traditional HFC technologies and/or emerging RFoG technologies, will provide an excellent end-to-end solution architecture for bandwidth intensive business services. The resulting system will be capable of supporting data services with bandwidths of 100 Mb/s or more per customer while leveraging existing data and voice networks and systems. Cable operators who have an extensive HFC network infrastructure and DOCSIS 3.0, delivered over HFC, can provide bandwidth/throughput per node serving area sufficient to support the majority of small and medium business and minimize costly fibre builds. This is a significant untapped market in Australia. The use of DOCSIS 3.0 has a few challenges, especially the allocation of RF bandwidth or spectrum for DOCSIS 3.0 services. In Australia, the cable broadband networks have a range of HFC architectures, including varying system capacity levels (750 MHz, 860 MHz and 1 GHz), and the allocation of spectrum within those systems may differ as well. The move from analogue to digital video has freed-up bandwidth within the HFC networks that can be used to deliver innovative services to small and medium businesses. There is a lot of bandwidth available in current and upgraded HFC networks that would meet and exceed the requirements of the NBN and future customer requirements up to at least 2026. The DOCSIS 3.0/ 3.1 specification delivers new features and benefits to the Cable industry when compared to its predecessors. Perhaps one of the most recognized benefits is a higher bandwidth capability. This new capability results from a DOCSIS 3.0 feature known as channel bonding. The use of channel bonding technology allows DOCSIS 3.0 systems to use multiple bandwidth channels simultaneously, thus creating the very high-bit rate capability. The QoS services implemented from DOCSIS 2.0onwards has allowed the transport of IP telephony or VOIP. The new DOCSIS 3.1 specification has also added over twenty channels or approximately 1 Gbps of additional RF bandwidth that may be used for new services. In addition, the changes in the spectrum allocation for the reverse path allow for nearly double the amount of spectrum to be allocated, to more than several hundred Mbps. 120 Mbps upstream per customer cable modem. In practical terms, the operators will offer these performance levels for ?power-user? customers. Everyday users will be delighted with a more consistent performance experience. Cable broadband networks can deliver open access where the operators are prepared to open up their networks. As cable networks use internet networking standard products, like modems and EMTA?s (telephony enabled modems) in the customer?s home or office, the operators could quickly launch new wholesale products and services for on-sale via independent retailers, facilitating diversity and energy in the retailing of broadband services. There are currently two smaller HFC operators in Western Australia who offer Layer 2 services to ISPs. OptiComm was the first of these operators to launch its wholesale only high-speed data services over its HFC cable platform in early 2012. The existing HFC networks in Australia can be made into a wholesale Layer 2/3 platform (as required by the original NBN vision). The technology provides a mature and stable platform for NBN Co. to support its rollout of a national, wholesale only, Layer 2/3 network, capable of delivering high-speed data services over an open access platform. This now seems to be a concept embraced by the Government and accepted by NBN Co.
Data networking between multiple sites of a commercial business represents a significant business opportunity for cable operators. Commercial data networks are usually implemented with private point-to-point data connections, such as Frame Relay, ISDN or ATM virtual circuits, often with equipment that provides transparent delivery of Layer 2 Ethernet LAN packets. A service that interconnects subscriber enterprise LANs with Layer 2 forwarding is called Transparent LAN Service (TLS). Business Services over DOCSIS can be used to create TLS. The TLS may include CPE from more than one CMTS in the cable operator?s network, other LANs attached to cable modems, and any other LANs bridged to the customer?s virtual LAN in the IEEE 802.1Q-compliant bridge in the cable operator?s backbone. The CPE in the TLS can be managed or operated just as if it was on a private Ethernet LAN, with IP addresses assigned by the TLS enterprise and taken from its subnet. The IP subnet of the TLS does not need to be coordinated with the enterprise clients or customers on the cable side of the TLS. Finally, the LAN subscribers in the TLS are isolated from the other customers in the cable operator?s HFC network(s) and from other Layer 2 VPNs. This is the same as the Layer 2 service envisioned for the NBN. Cable operators are evaluating alternatives to support the ever-growing demand for bandwidth or spectrum. 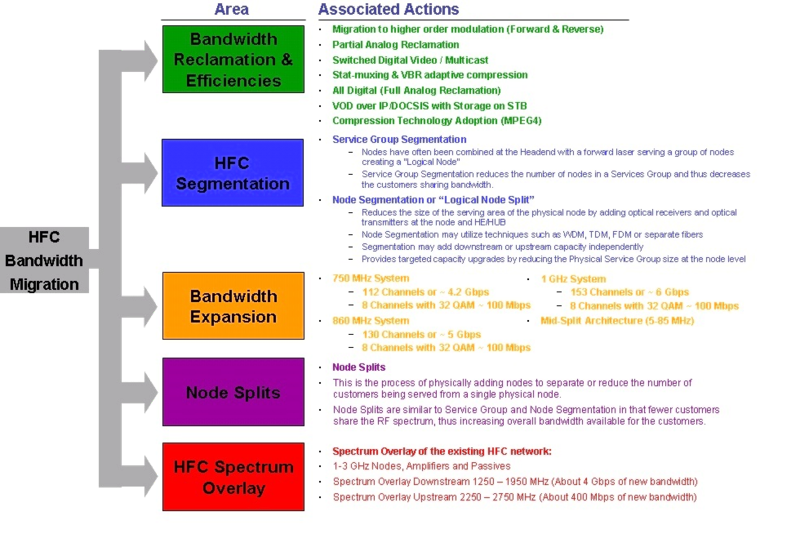 With a flexible and scalable HFC architecture, finding the RF spectrum may be accomplished in many ways, including Bandwidth Reclamation and Increased Bandwidth Efficiencies, HFC Segmentation, Bandwidth Expansion, Node Splits and HFC Spectrum Overlay (Figure 2). None of these options need to be done system-wide; they may be targeted capacity upgrades implemented (for lower than average capital outlay) at the node locations that need the additional bandwidth (perhaps a node serving the DOCSIS business customer). Using targeted node upgrades to leverage some of the channels in the 860 MHz to 1 GHz spectrum range may offer significant new capacity for DOCSIS 3.0/DOCSIS 3.1 services. This allows the spectrum below 860 MHz to be used for video services and legacy DOCSIS 2.0 channels. If systems have not been upgraded to 1 GHz, these could initially be targeted node upgrades in the areas that need the additional bandwidth. Figure 2 outlines the breadth of techniques for unlocking HFC network capabilities. The RF engineers within the cable broadband industry understand the massive under-utilised bandwidth capability within these networks. Traditional Australian carriers with a bias towards ADSL2+/VDSL2 network elements on a copper-based infrastructure are now beginning to understand and appreciate cable?s latent competitive advantage over their traditional copper networks. A modern HFC cable network infrastructure can provide as many as 120 discrete channels to deliver time sensitive and best effort services. The HFC architecture is remarkably flexible; there are a host of ways a cable operator can create additional bandwidth. However, if DOCSIS 3.0/DOCSIS 3.1 over a standard HFC architecture is not desirable or possible, there is another outside plant option to explore that leverages DOCSIS 3.0/ DOCSIS 3.1 over an all fibre-to-the-premises approach, called Radio Frequency over Glass, or more commonly referred to as RF over Glass (RFoG). RFoG is an acronym for the fibre-to-the-premises suite of products and services that will emerge from the working group 5 of the SCTE?s Interface Practices and In-home Cabling sub-committee. This working group formally began in March 2008. It supports the use of existing set-top boxes and DOCSIS equipment such as cable modems. RFoG is an emerging technology which may offer a second alternative to traditional HFC solutions. Essentially, RFoG is similar to HFC architecture with the coaxial portion of the network residing only in the inside wiring at the customer premises, but extending fibre throughout the outside plant network to the customer premises location. RFoG supports all of the existing cable services, including all video and DOCSIS services (ARRIS 2007). The RFoG solution uses existing support systems and head-end elements (network elements and provisioning systems for video, data, and voice) in the cable broadband operator?s network. The traditional cable installation practices are leveraged as well as CPE equipment and services, such as analogue and digital set-top boxes, and DOCSIS cable modems and services. An RFoG service group size will likely be in the range of 32 households passed (HHP); however, processing and combining at the head end will remain an option, as with traditional HFC. This allows CMTS equipment to be shared over a larger pool of service groups for even greater economies of scale. By deploying an all-passive optical network, like RFoG or PON systems, service providers can achieve lower operational costs than fibre to the node approaches with no actives or copper wiring in the outside plant. All of the existing services and technologies delivered over HFC can equally be delivered over RFoG: the benefits include smaller service groups for greater bandwidth, an all-passive optical network to the home, and a migration strategy for even higher bit-rate technology over EPON or GPON while still using RFoG. In Figures 3 and 4, a contemporary HFC architecture and the RFoG architecture are illustrated. Essentially, the coaxial cable and actives portion of the outside plant of the HFC network is replaced with an optical splitter. The RFoG systems have a WDM multiplexer at the head end, allowing the optical wavelengths to be combined on a single fibre down to the customer. The RFoG customer premises equipment is essentially a media converter, receiving and transmitting the optical signals and interfacing with the coaxial network at the customer premises. All the customer equipment can be upgraded to the higher performing network without cabling changes. For economic reasons, it is neither necessary nor likely that RFoG would be a replacement technology for existing HFC deployments, except where fibre deployment is mandated or regulated. However, RFoG offers an alternative for new build areas (greenfields) or even brownfields where fibre is mandated or highly desirable, and operators may consider RFoG builds in extensions to their existing HFC deployments and new build areas, as they move to push fibre deeper. With this architecture, a cable broadband operator could deliver symmetrical data rates approaching 100 Mbps for a business service. The SCTE?s Working Group 5 specification is maturing: it reveals a high degree of alignment with IEEE standards. The current position of the RFoG optical architecture in the outside plant could use the 1550 nm wavelength on the forward path and 1610 nm on the return path. 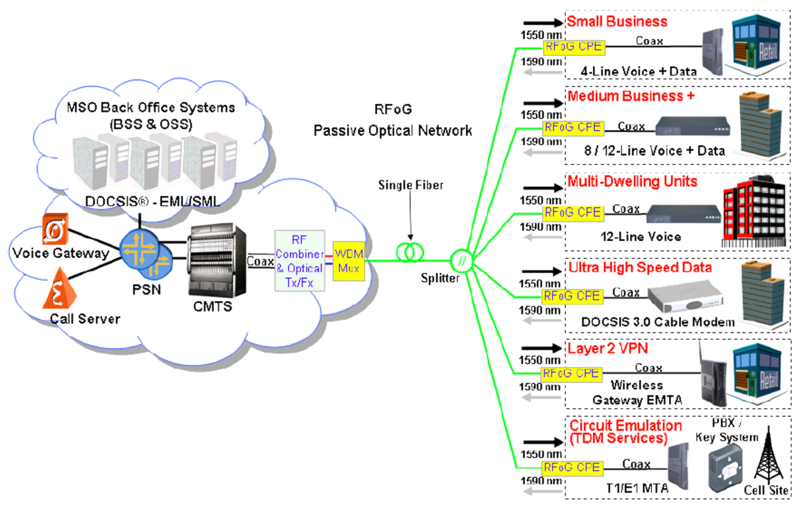 Figure 5 is an example of an RFoG and DOCSIS system and shows the leverage of fibre-to-the-business (FTTB) using RFoG technology and traditional DOCSIS systems at the head end and customer premises. The Federal Government, and NBN Co., recognise the power locked in the HFC network assets currently deployed in Australia and, through the Vertigan report, they hope to clearly understand the economics and viability of their preferred model for the so-called multi-technology mix platform (Drurie 2014). Australian cable operators have extensive HFC network infrastructure in place and, combined with DOCSIS 3.0 and DOCSIS 3.1, would be sufficient to support the majority of residential and small- and medium-business service needs for approximately 7 million Australians today, thus minimizing costly fibre builds or unwanted duplication of broadband assets. However, if fibre solutions are preferred for business customers to resolve any operational concerns about active outside service plant networks or to support future bandwidth growth, new technologies like RFoG offer a great alternative to shared media GPON optical solutions. High-end DOCSIS CMTS equipment already has integrated, highly reliable redundancy schemes that may not be found on Ethernet Switching or PON network elements, and this provides assurance to the operators that the access layer is engineered at 99.999% availability. Leading cable operators worldwide are driving the vendor industry to develop the next generation of products, based on open industry standards, so they can cost effectively expand their geographic footprint to penetrate the markets of the incumbent traditional telecommunications operators. In Australia, we have the two biggest operators using all forms of technology platforms: fibre to corporate customers, ADSL2+ to small and medium business and residential, and wireless for mobility customers. We have a model of competition but no intermodal competition. It is time to include the HFC CATV networks into the mix and provide consumers with real choices and a true broadband experience. It is also time that the over-riding driver for the Australian Government (and therefore NBN Co.) is an affordable rollout of decent broadband coverage to the promised 93% of subscribers ? especially if there is a sensible approach to expand coverage through cost effective infill and expansion to the nearly one-third of the population in current HFC service areas. This would leave the lion?s share of the NBN Co. budget for coverage of outer metropolitan, rural and regional areas better suited for deployment of technologies such as wireless and satellite. ARRIS, White Paper, Howald, Robert L, McCarthy, Sean T. Accounting for Techies:Taking it to the Ultra. 2012. ARRIS White Paper, Michael Emmendorfer. RF over Glass - A new Triple Play Option for Business Services. October 2007. Cox, Dermot. 2009a. ?National Broadband Network?, Submission to Senate Select Committee on the National Broadband Network, from C-COR Broadband Australia, 10 February 2009. Cox, Dermot. 2009b. ?National Broadband Network?, Opening Address to Senate Select Committee on the National Broadband Network, from C-COR Broadband Australia, 4 March 2009. C-COR Broadband Australia. 2010. Submission to Australian Senate Select Committee on the National Broadband Network, 30 March 2010. Drurie, John. 2014. The Australian, 06 June2014.